Earlier we were sent over a new set of images from the geriatric-fest that The Expendables are more becoming. Seemingly with an average age of about 80, the old clunkers are back in front of the camera trying to re-live their glory days of the 80s. They managed to do that with the first two. They were silly but deservedly so considering who were in them – the same old farts that are in this one! This time, the images are more action based compared to the first set. Even so, you can hear the joints creaking even in the stills. Still if people of the “Babyboomer generation” can still do that, just look at other boomers. It’s not only the old fats that get their on images. The new guard are there as well. Even if some of them ‘aint no spring chicken as well! Just look below the sysopsis for a chart of how old everyone in the main cast actually is & how this effects the average age of them! 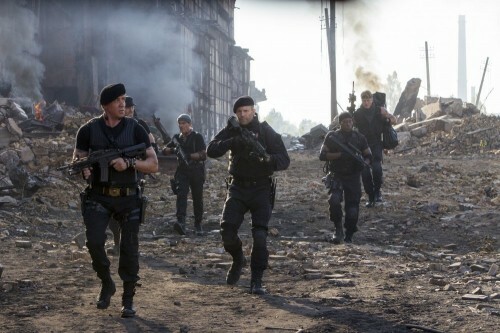 With 657 years between the expendables, making them an average age of 50years & 193 days. That makes noboby a young chickens that action films should have.